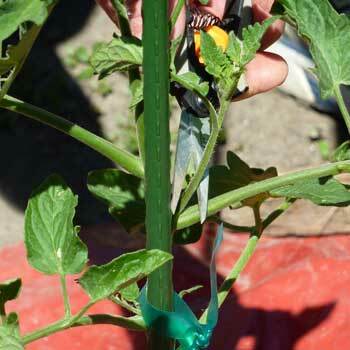 In the below video "How to prune tomato plants" you'll see how simple it is. The key is locating the suckers, also known as sideshoots. These are the new growths that grow in the V-shape (axil) where a leaf branch and the main stem come together. You can prune with either your hand or a cutting tool such as scissors, knife, or small pruning shears. It's best to remove the suckers soon after they start growing. If you do use cutting tools, you should wipe the cutting edge with germicidal wipes (or a 1:10 concentration of bleach to water) to avoid transmitting disease between plants. Also, don't apply pruning compound sealant intended for use on shrubs and trees. If the sucker stems are allowed to grow, they will become complete new vines with their own fruit and leaf branches. In fact, you could even start a whole new tomato plant from these cuttings! Just root the stem in moist growing material or even plain water for a couple of weeks. Cut or snap off the unwanted suckers or branches close to the stem. The wounds will heal naturally in a couple of days. Cut or snap off all sideshoots other than the main stem. It's also a good idea to entirely remove any yellow or brown branches on the lower part of the plant. If you want to limit the height of the plant to the stake height then pinch off the top of the plant. While pruning keep in mind that you should leave enough foliage cover to protect the fruits and stem from sun damage. I used these small Fiskars pruners because they are very sharp and easy to maneuver. If you can't find these locally you can feel secure buying at Amazon.com.